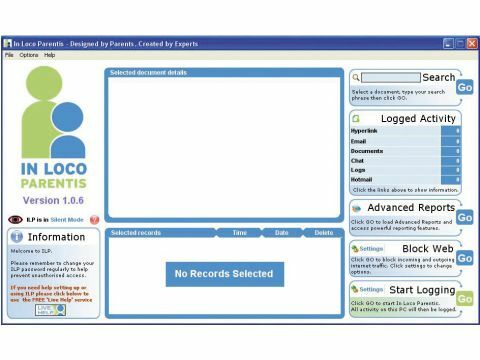 In Loco Parentis is sold as "safety and anti-grooming software". It's supposed to help you protect your child from unspecified online nasties by monitoring their activity. Once installed, this software sits invisibly on your system, enabling you to spy on your kids without their knowledge. Type the password and In Loco Parentis magically appears. Click Go and the software begins to log everything that's typed and all the URLs that are visited. You can enter a list of Watch Words and specify an action to take place if your child types them. Actions include notifying you by email, displaying a warning message or closing the application into which the word was typed. We found that the email notification feature caused a firewall alert that blocked the sending, and we didn't understand the point of closing the application because it can simply be restarted. If the banned word was a search term, browsers that use crash recovery will load the page containing the search results upon restart. There's an option to store screen shots of specified applications, but In Loco Parentis crashed when we tried to view them. It's possible to specify individual URLs to block, but this is useless if you're attempting to keep your child from viewing unsuitable content on the web because you have to enter each site manually. There are plenty of other applications that censor the web using a proper, pre-compiled list of undesirable sites. The documentation tells us that In Loco Parentis can't always monitor both sides of an instant messaging conversation. So, unless your child's side of the dialogue gives the game away, a conversation with a questionable individual could take place. These gripes, however, aren't the most problematic aspects. In Loco Parentis has serious stability problems. We also found it's often impossible to open the program to view logs and change settings. When In Loco Parentis is working it records all keystrokes and lists the URLs visited. This may be of some use, but is by no means a complete solution to protect your child from dodgy people and dubious sites.